Gregg Orthodontics has been providing Ashland, Wooster, Mansfield, and all surrounding Ohio areas with the latest in orthodontic technology in a comfortable, fun environment where we treat each patient with respect. Dr. Gregg’s thorough education in the field of dental care and surgery, and specialization in high-tech orthodontic treatment, has enabled Gregg Orthodontics the ability to exclusively offer adult and teen patients a customized invisible way to straighten teeth using Incognito Appliance Providers and Invisalign Providers. Additionally for correction jaw alignment, Unitek Forsus springs have virtually eliminated the need for bulky headgear appliances and months of rubber band wear. These services result in decreased overall treatment time and less demand for patient compliance! The high-quality customer service and exciting, yet informative treatment separates Gregg Orthodontics from other practices. The team of knowledgeable and helpful staff ensure that each patient is given the proper care. 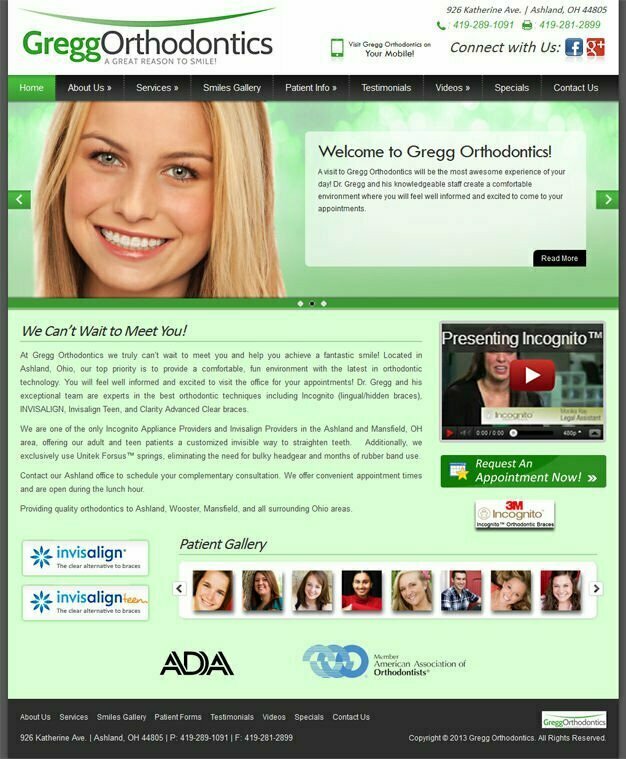 To provide a place where information is available for every aspect of the orthodontic experience, from your initial appointment to the introduction of orthodontic techniques used, Gregg Orthodontics required an online platform where they could reach out to a larger audience. Pulse created an aesthetically pleasing design using WordPress and MySQL technology with easy navigation and mobile capabilities. With CSS optimizing the style of presentation to improve content accessibility Pulse was able to provide detailed information while maintaining a clutter-free look. The end result is a welcoming website that encapsulates Dr. Gregg and his team’s orthodontic abilities and simplifies the initial process for new patients, giving access to quality care to a broader range of people. With greater exposure, Gregg Orthodontics is now guaranteed to be in the business to years to come, providing beautiful smiles for each and every person who comes under their care. Contact Pulse for your web designing needs.